After being found guilty of desertion, 28-year-old Private Frank Hughes was killed by a firing squad in Hallencourt, northern France. He was the first New Zealand soldier executed during the First World War. Born in Gore in 1888, Hughes worked as a builder’s labourer in Wellington before enlisting in the New Zealand Expeditionary Force (NZEF). He left New Zealand with the 10th Reinforcements and arrived in France in late April 1916. A month later he joined the 12th (Nelson) Company, 2nd Battalion, Canterbury Regiment. A heavy drinker, Hughes was soon in trouble. By late July 1916 he had been hauled before his commanding officer three times for ill-discipline. On 26 July a Field General Court Martial found him guilty of ‘absenting himself without leave’ and sentenced him to one year’s imprisonment with hard labour. This sentence was suspended after review and Hughes was issued a final warning. Despite his protestations Hughes was found guilty and sentenced to ‘suffer death by being shot’. At the end of the trial, he was remanded in custody. His sentence was confirmed by the Commander-in-Chief of the British Expeditionary Force, Field Marshal Sir Douglas Haig, on 22 August. Two days later, and 12 days after his court martial, Hughes was told his fate. The execution was carried out the next morning in an orchard in the village of Hallencourt. Hughes was led from his cell and placed against a tree. 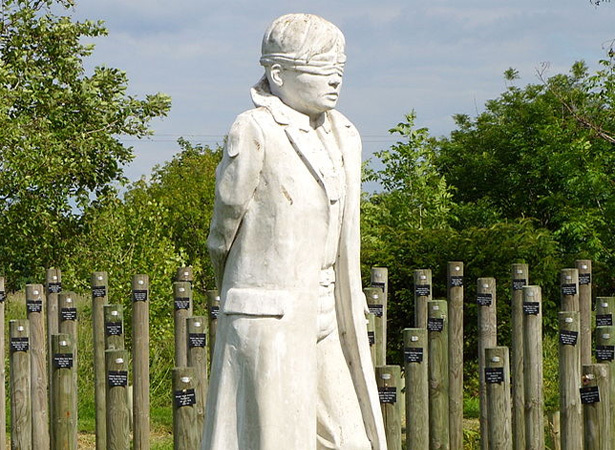 He was offered a blindfold but refused, reportedly saying: ‘Don’t put the bandage over my eyes – I want to see them shoot.’ At 5.50 a.m. the firing squad, made up of men from the New Zealand Pioneer Battalion, opened fire. Hughes was buried in the adjacent Hallencourt Communal Cemetery. Frank Hughes was one of 28 members of the NZEF sentenced to death during the war. Five of these men, all privates, faced a firing squad: John Braithwaite, Hughes, John King, Victor Spencer and John Sweeney. Four were executed for desertion, Braithwaite for mutiny. We have 20 biographies, 40 articles, related to New Zealand soldier executed.